Just about an hour south of Savannah’s bustling squares lies a peaceful seaside retreat deeply rooted in history. Once the winter escape of some of the famed financiers of the gilded-age—Rockefeller, Carnegie, Morgan, and Vanderbilt to name a few— Jekyll Island retains the beauty and elegance of that bygone era, while being an inviting destination for traveling families. At only eight miles long and about a mile and a half wide, Jekyll is the smallest of Georgia’s Golden Islands, an idyllic group of barrier islets nestled amidst pristine salt marsh and breathtaking Atlantic shoreline. It boasts 20-miles of bicycle paths, 10-miles of unspoiled coast, and prolific natural beauty—the perfect ingredients for a few days (or more!) of low-tech family adventures. Here are five ways to unplug during your time on Jekyll Island. The calm waterways and tidal creeks that fringe Jekyll are ideal for even beginners to explore by kayak or stand up paddle board. One of the best places to start is the 4-H Tidelands Nature Center, where knowledgeable and enthusiastic naturalists lead a variety of adventures. On a three-hour excursion paddlers might see dolphins, sea turtles, or manatees, along with myriad shorebirds and sand-loving crustaceans. Naturalists provide information about the flora, fauna, and diverse ecology of the islands throughout the tour along with helping kayakers to navigate the waters of the marsh. Few activities shout summer like a relaxing pedal aboard a beach cruiser – with a towel in your basket and sand on your feet. Jekyll’s traffic-free bike paths are a fantastic way to explore the island and the flat topography makes it easy for the youngest cyclists to follow along. Wend your way beneath towering live oaks draped with lacy Spanish moss as you cycle several shady loops that lead pretty much anywhere you might want to go—just watch out for the fiddler crabs scrabbling over the boardwalk! The abundant natural areas on Jekyll create optimal habitats for a variety of wildlife, and many rare and threatened species find safe haven within the island’s diverse ecosystems. A birder’s paradise, the Georgia Audubon has designated Jekyll as an important birding area and enthusiasts and novices alike will delight in spotting herons, spoonbills, egrets, plover, and even the occasional bald eagle around Jekyll’s shoreline, dunes, tidal marshland, and rich maritime forest. Not just for kayak tours, the Tidelands Nature Center’s naturalists lead nature walks a few times each week to captivating beach, marsh, and woodland locations around the island. Back at the nature center there are excellent live animal exhibits, several interactive displays, and two touch tanks where visitors can discover many of the creatures that make Jekyll Island their home. But perhaps the crown jewel of Jekyll Island’s conservation efforts is the Georgia Sea Turtle Center located in the historic district. Upon arrival pick up a card titled, “My Sea Turtle Journey.” This scavenger hunt leads guests through the life cycle of a sea turtle, from nest to adult, in the center’s main exhibition area. The center offers several special programs throughout the day that include turtle feedings, ‘meet the patient’ talks, and behind the scenes tours. For a truly amazing experience, join an evening turtle walk to search for nesting adults in June and July or an early morning hatchling walk in August and September when babies are expected to emerge from their nests. You’ll have ample opportunity to take a dip in the ocean during your time on Jekyll as one entire side of the island is bordered by the Atlantic. One thing to note, despite the soft, white sands on the beach and dunes, the waters surrounding Jekyll Island are murky brown in color from sediments and tannins that flow into the sea from nearby rivers and marshlands. Still, the beaches on Jekyll are wonderful—replete with interesting shells and aquatic critters and perfect for lounging on a hot summer’s day. 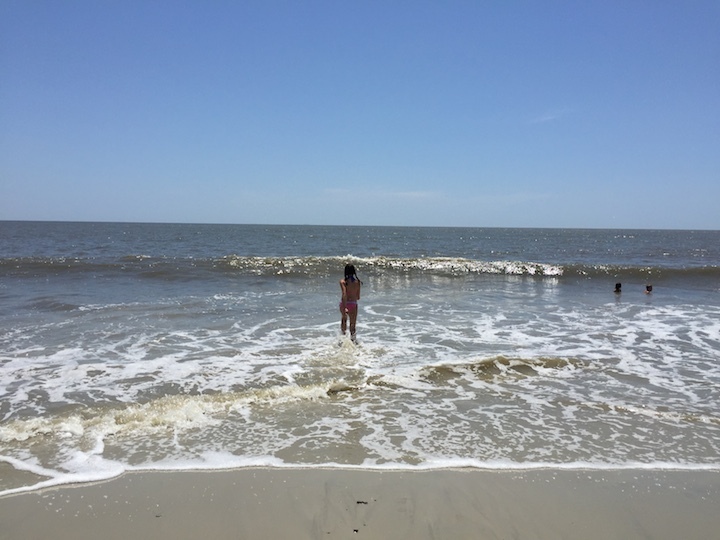 There are three main beach areas on Jekyll Island and each one is worth a visit. On the southern end of the island, walk along the long boardwalk over the dunes to Glory Beach, where the 1989 Civil War movie of the same name was filmed. If you’re looking to set up shop for the day, Great Dunes Beach located around the island’s midpoint right across the street from the Jekyll Island Bike Barn on North Beachview Drive. Great Dunes offers plenty of services including picnic pavilions, public restrooms, and beach showers. Just north of Great Dunes is the Jekyll Island Club’s beach pavilion and guests of the hotel enjoy complimentary towels, beach chairs and umbrellas. There is also a snack bar with casual lunch fare, hand-scooped ice cream, and cold drinks. Finally, ride out to the island’s north end to explore a truly unique stretch of shoreline at Driftwood Beach. A hundred years of crashing surf and subsequent erosion has left behind the graying remains of live oaks and pines along with their gnarled root systems. The skeletal limbs cast eerie shadows in the sand and the fallen trees and upturned roots are fantastic for climbing. At low tide, rocks along the shore create miniature tidal pools replete with interesting aquatic creatures. Sunrises and sunsets are glorious here and the beach is a great place for memorable family photos. From pre-colonial beginnings to glamorous 19th century prestige and on to its present day recreational bliss, Jekyll Island has a rich and storied history. An excellent place to begin learning about island heritage is at the Jekyll Island Museum where you’ll go back to the days of the island’s earliest inhabitants. Right across the street is the island’s picturesque historic district and narrated tram tours or a carriage rides depart from the museum several times each day. We enjoyed cycling around the grounds of the beautiful Jekyll Island Club and historic district. Many of the club members’ original “cottages” have been restored to their former glory along with a charming chapel that welcomes visitors daily. Relaxing in a rocking chair on the Club’s porch, croquet lawn below and the wharf in the distance, is the perfect way to end your day’s activities. You’ll almost feel like you stepped back in time. Which Hawaiian Island is Best for a Family Vacation? Gina Vercesi is a mother, teacher, writer, runner, hiker, gardener, foodie, and nature girl, with an adventurous spirit and an unyielding sense of wanderlust. In 2009, Gina founded Kids Unplugged as a family nature club. Kids Unplugged has since morphed into a full-fledged family travel site focusing on low-tech, off-the-grid adventures for families. On the flip side, Gina also has what she calls a Disney vice and is an Authorized Disney Travel Planner and Disney travel guru creating magical, stress-free Disney vacations for families.